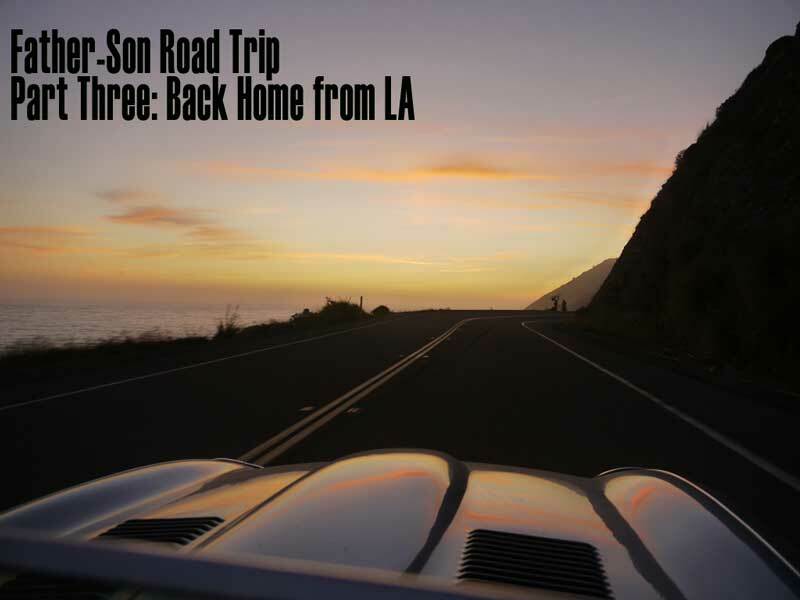 Note: The following is a re-write of my father-son road trip story for the JagMag. 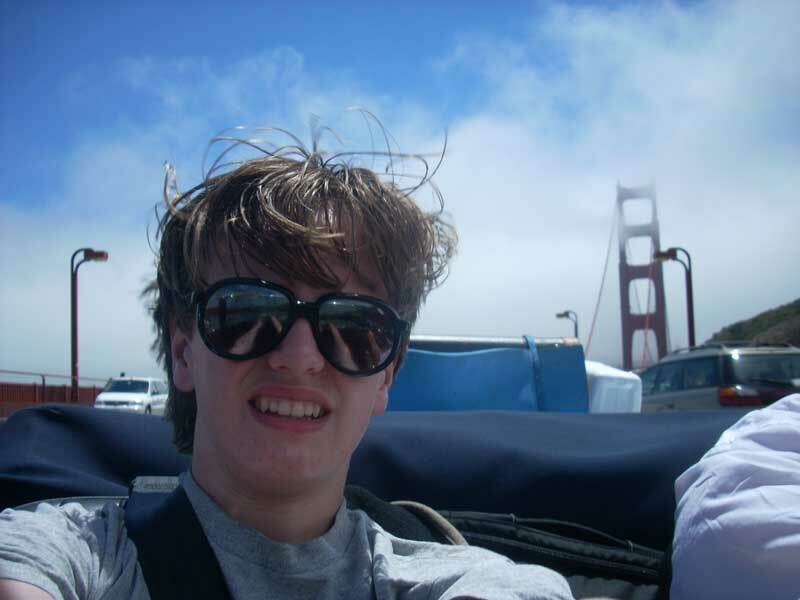 Now joined by my younger son Nicholas, age 15, we began the return journey to Seattle from Los Angeles. For the first two days of our journey we would be accompanied by my friend and host Larry Wade from La Canada, California, along with a Wade family friend from Norway, named Ã˜yvind Aamodt. 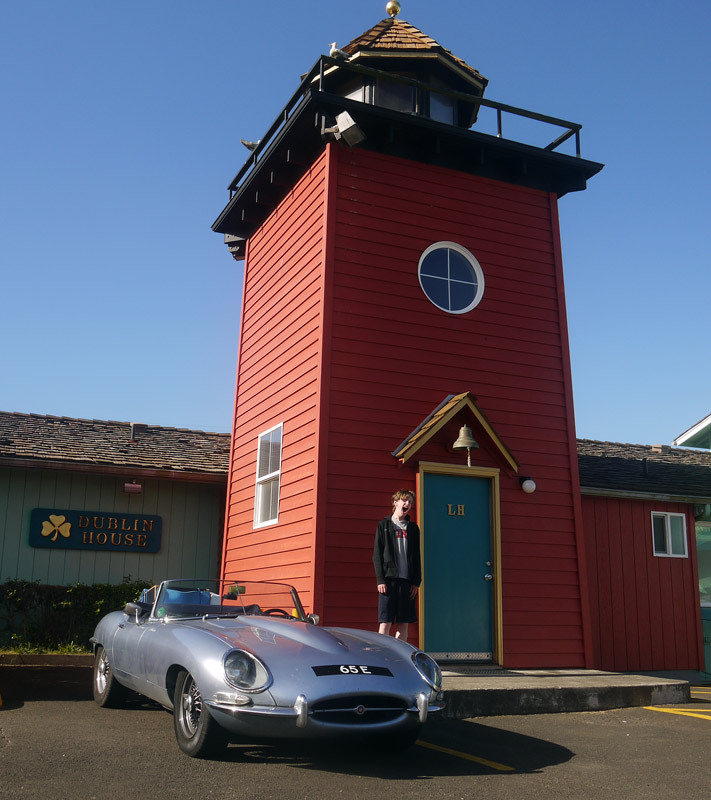 Larry drives a 1962 E-type OTS and we met via the E-type group on jag-lovers.org. 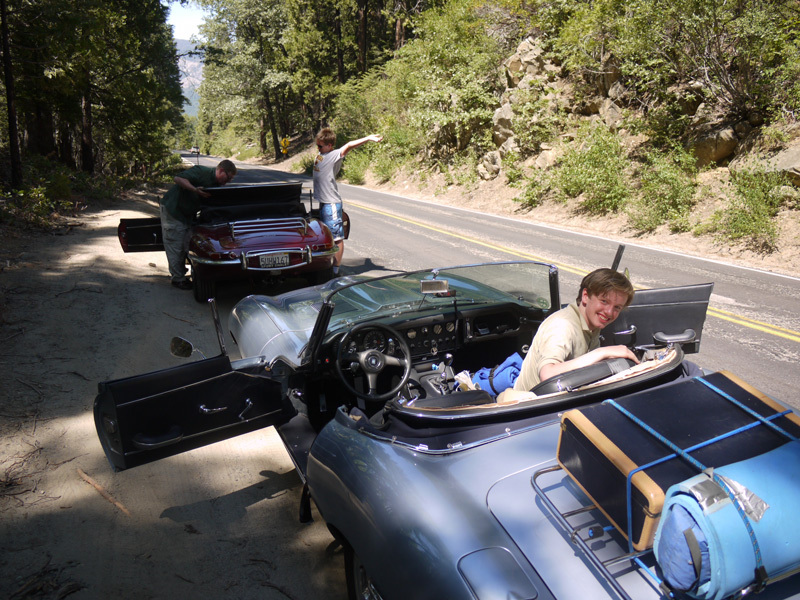 With Larry leading the way we would not have to do much in the way of navigation for the first couple of days, as it was just a case of “follow that Jaguar!” Having already been down the coast, we chose to head for the California Sierras for some sightseeing and mountain driving. The temperature drops rapidly as we climb the Sierra foothills, and the trees provid welcome shade. Nick and I feel much better to be out of the broiler of the Central Valley. We arrive in Yosemite National Park in mid-afternoon, stopping at several scenic vistas as we approach the famous Yosemite Valley. I had not visited Yosemite since the mid-80s, but this is Nick’s first visit. As we enter the valley all of the batteries of our digital cameras run dry, so instead of shooting photos I provide my son with a guided tour of the valley’s sights and major rock formations. He loves every minute of it. Exiting the valley we drive towards Tioga Pass to the White Wolf campground where the two E-types once again draw stares from other campers as the most unlikely RVs ever seen. We enjoy a great night out under the stars. The following day we drive through Tuolumne Meadows, up and over Tioga Pass, down to Mono Lake, then lunch at Bridgeport. This is where Larry & Ã˜yvind turn back to LA, and Nick & I continue north. We say our farewells, then make a stop at Lake Tahoe to admire the deep blue of Emerald Bay, then double-back onto US Hwy 50 and towards the Bay Area. 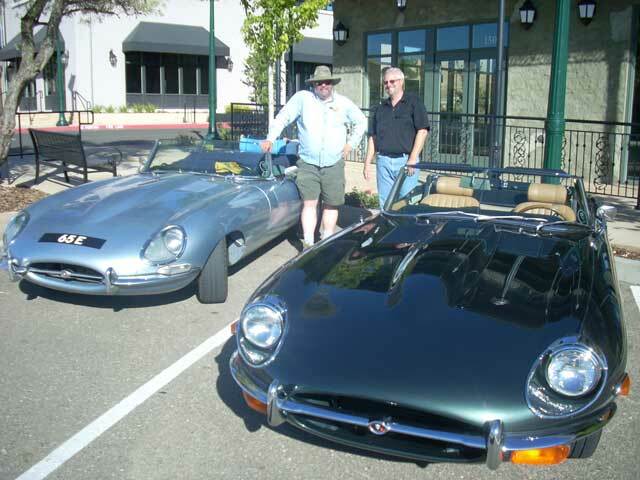 As we come down through California gold rush country I call David Shield, another E-type owner I know through jag-lovers.org and arrang to meet him and another another E-type owner, Tom Pope for a cool drink. Our plan is to allow the sun to set before we again entered the Central Valley! We head up the coast for what becomes a magical afternoon and evening. At first Highway 1 is choked with traffic, but a construction stoplight stops us for 20 minutes and once underway again we never see another car ahead of us! The road is a joy, the weather is mostly excellent (despite a short section of thick, cold fog around Mendocino that had us bundle up), and as the sun heads for the horizon we stop and hit the beach to enjoy the sunset. We make it about half-way up the Oregon Coast and stop at a small motel in Yachats that advertised a heated indoor swimming pool. After a day of running around on beaches we really need a swim! The clerk offers us a cool room in the form of a lighthouse which turns out to be funky and fun. Nick sleeps on a very high bunk which he thinks is cool. 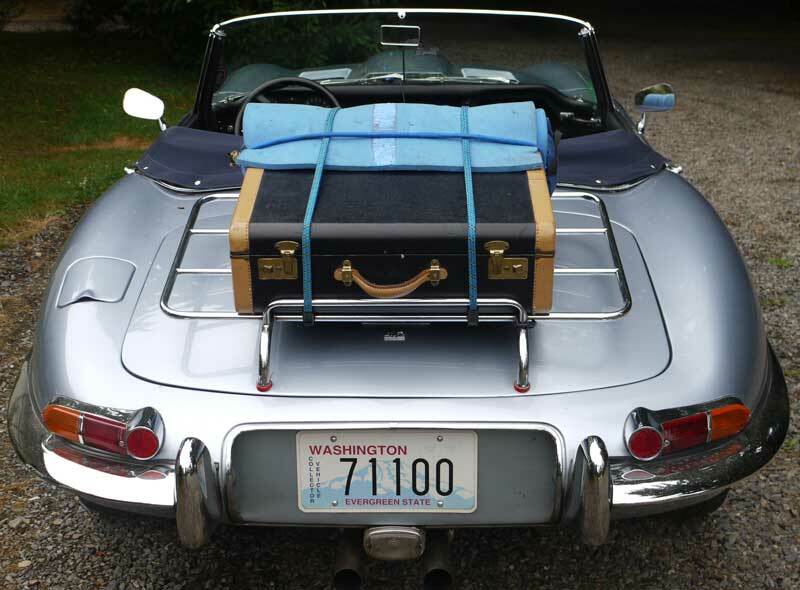 The morning finds the E-type the star of the motel’s parking lot, with a dozen travelers admiring its beauty. I deputize them all into a push-starting crew, and they enthusiastically agree. The parking lot was flat, and Nick is happy to have the help! Traffic on 101 is again not conducive to spirited driving but side-trips prevent me from going insane. A highly recommended alternative to US 101 is the Three Capes Scenic Drive. It is occasionally crowded with bicycles but is otherwise blissfully empty of traffic. Nick & I enjoy a lunch in Astoria, then cross the long bridge into our home state of Washington. Just as on the southbound leg of the trip the weather forecast in our home state was for rain, so once we approach Olympia, we opt to hit I-5 and bee-line home for Arlington. Sure enough as we near our home the rains begin to fall. Arriving home is, as always, bittersweet. These almost two weeks on the road with my boys are so amazing that I didn’t ever want it to end. The car however needs to be fixed (I have a new starter installed with the help of both my boys within 10 days, just in time for the Monte Shelton Rally in Oregon) and I have to get back to work. Each of my sons has a unique personality and makes for very different traveling companions. Given the chance I’d hop in the car with either of them and drive off for parts unknown. 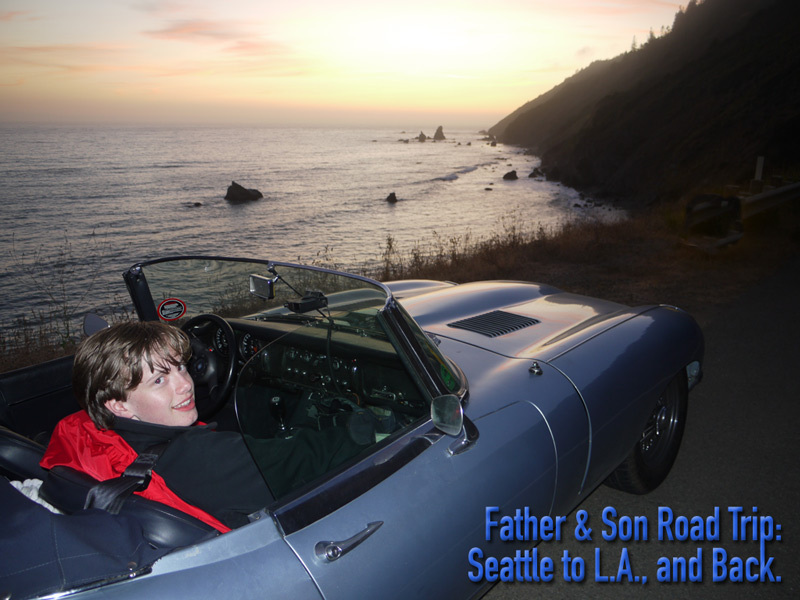 Traveling in a vintage car is a reward in and of itself, but doing it with my kids makes it so much more enjoyable. While I doubt we’ll be able to repeat such a lengthy journey anytime soon, I hope to make many more with them individually whenever the opportunity arises in the future. Even if the car breaks (as old cars are wont to do) we can tackle most any repair, and we’ll get to know the car, and each other better along the way. As I stated at the beginning of the series this is the best way to get young people interested in old cars. 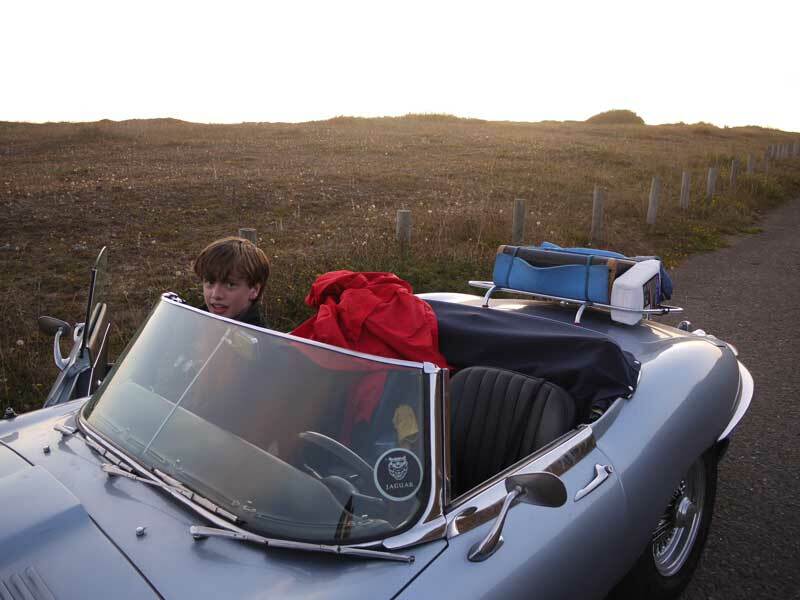 Go on a road trip with the next generation of potential enthusiasts. 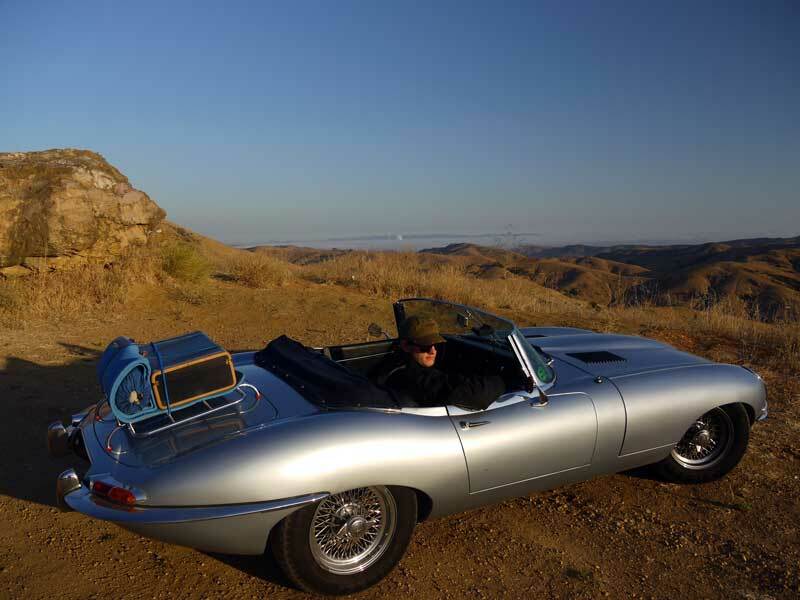 Let them experience first-hand the joys and occasional trials of vintage motoring. Old cars are things to be used and enjoyed, best of all with your children. On the southbound leg of the trip I am accompanied by my eldest son, Christopher. He is 19, and had just finished his Freshman year of college a few weeks before our departure. I eagerly anticipated this chance to travel with him as other than a few brief visits, I had not had much of a chance to spend time with Chris since he left for college the previous autumn. Unfortunately after many weeks of brilliant sunshine and mild weather, the weekend chosen for starting our father-son road trip brings thunderstorms to the Pacific Northwest. Rain we’re used to, but lighting and thunder are rare occurrences. We have to wait for the storm to blow over which delays our departure by two and a half frustrating days. Thankfully our plans are very flexible, and the delay doesn’t really upset anything other than my desire to be on the road. When the weatherman says that the skies will clear by the end of the day, we depart our home and head south on Monday, July 13th. 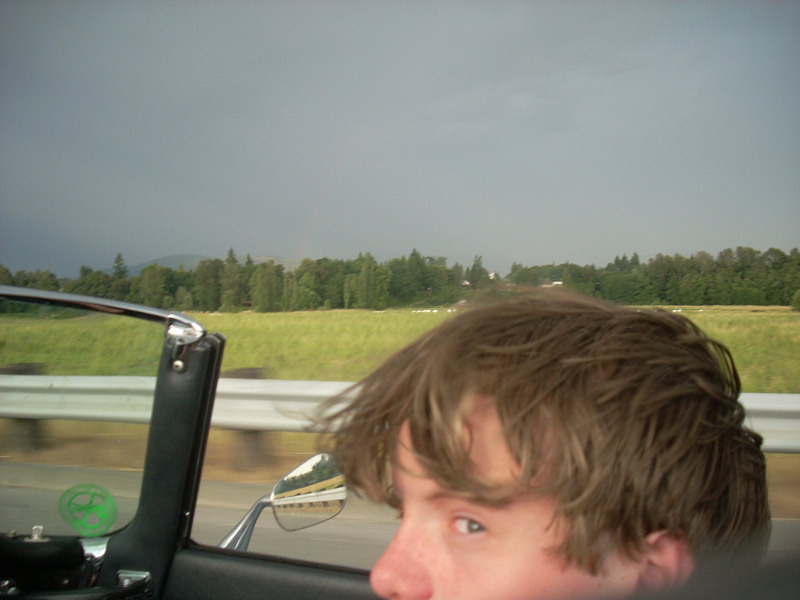 Our original route plans would have taken us out to the coast and around the Olympic Peninsula, but now we’re just blasting south on I-5 through scattered showers as we’ve given up on Washington’s sights and want to get to places further afield. At Longview we leave the freeway and cross over into Oregon. Chris is a real history buff, so our aim is going to McMinnville is to visit the Evergreen Aviation Museum, home to the “Spruce Goose” and many other historic aircraft. We arrive too late in the day to get into the museum, but there are many exhibits outside and we park the Jaguar next to Medal of Honor recipient Major Leo Thorsness‘ F-105g “Wild Weasel” and then spend about two hours walking around the exterior of the museum and soaking in the outdoor exhibits in the long summer twilight. “I probably wrenched on that bird at one time or another. They were very limited modified 105s that flew out in front of B66 chafe slingers and B52s in Southeast Asia. The ECM emulated the B52s and the SAMS would lock on and shoot at the 105s. In return, the 105s would lock on the SAM pads and fire back with AGM 78s(air to ground missiles). They had about three seconds to dodge the telephone pole sized SAM or they didn’t come back. I lost two planes and crews during my service there. Chris & I return to the museum the following morning, and spend almost all day touring the exhibits inside. The highlight of the day is a tour of a B-17 by a former pilot. His name is Barney, and our tour is only supposed to be about 8 minutes long. He begins by showing us the outside of the plane, and describes both the design goals and the realistic limitations of the aircraft. 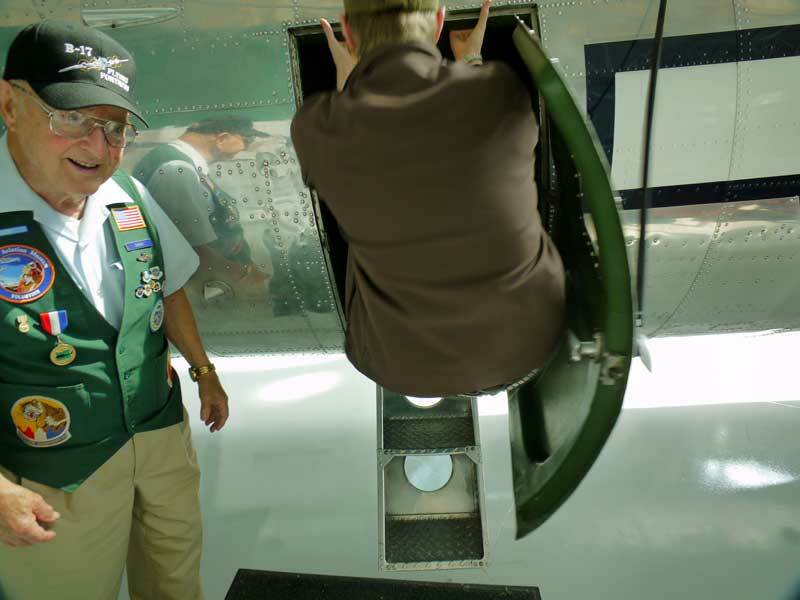 When we approach the waist hatchway of the B-17 something happens that will always be one of my fondest memories of this trip. Barney tells us that the B-17 now has a set of steps installed so that visitors can easily climb in, including him as he’s now in his eighties, but when he was flying they had to vault themselves into the plane. Christopher immediately vaults himself into the plane without touching the steps, bringing a huge smile to Barney’s face and changing his demeanor noticeably. 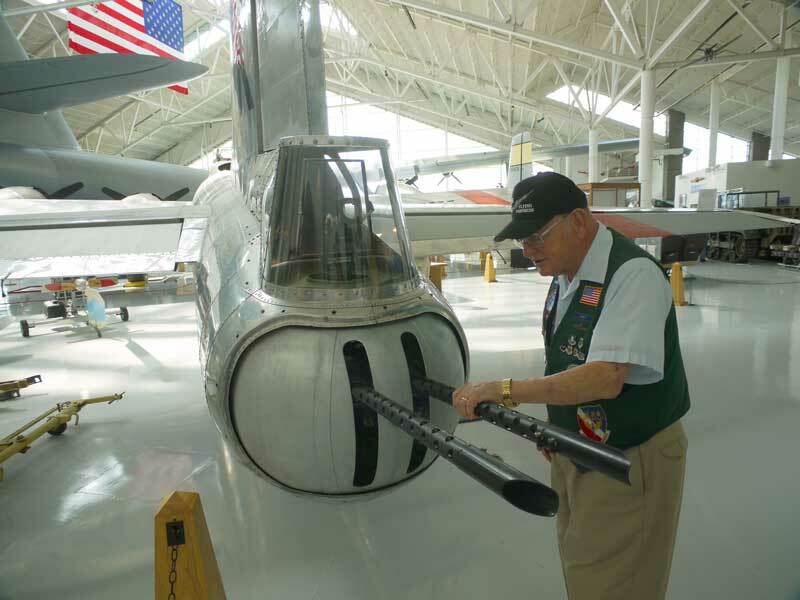 Our eight minute tour stretches well beyond thirty minutes as Barney provides detailed background, stories, and observations concerning every bit of this remarkable aircraft’s interior and his experiences in WW2. 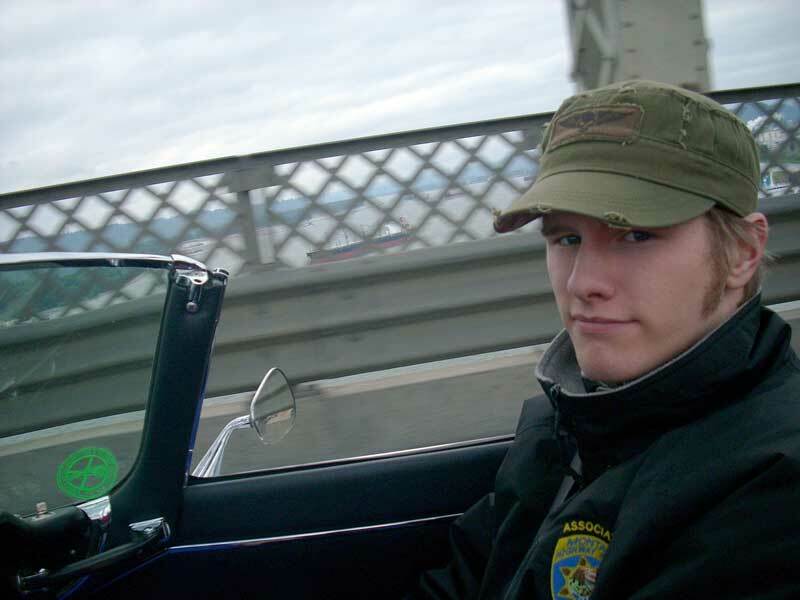 Christopher’s simple youthful act obviously connects with Barney at a very emotional level, as he was Chris’ age when he served our country. Chris being a history buff is soaking it all up. It is a wonderful moment to observe, as a parent, as an American, and as a human being. From McMinnville we drive south to Eugene and enjoy a late lunch with a friend, followed by a drive to, and then down the coast. Along US 101 we see an Alfa Romeo Montreal driving north. 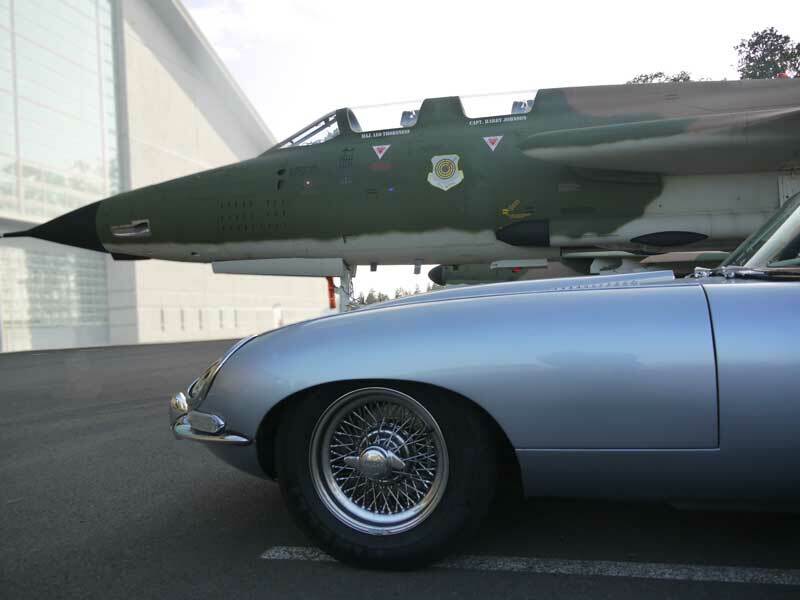 I point it out to Chris and say “You don’t see those every day!” Then I followed up by saying, “I bet the guys in the Alfa just said ‘Wow, an E-type Jaguar! You don’t see those every day! '” As the sun goes down we arrive in Bandon, where we camp for the night in one of Oregon’s state parks. 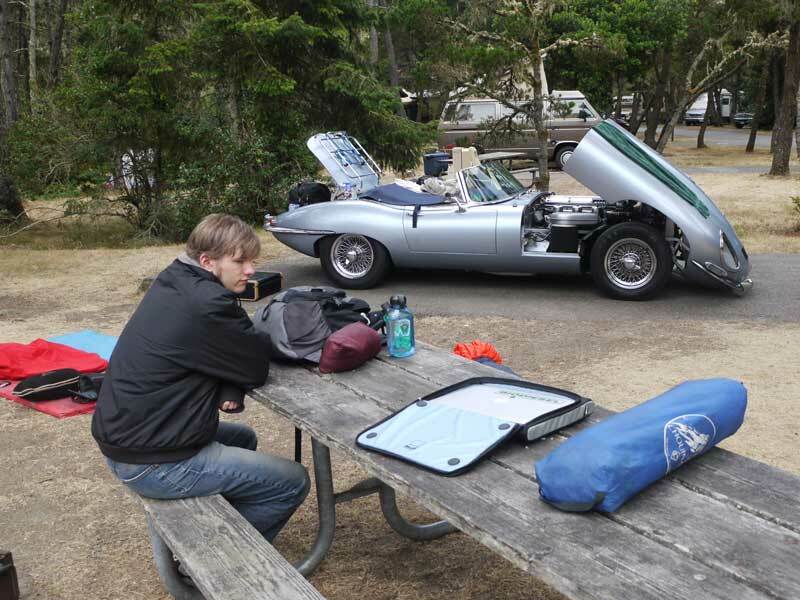 The E-type gets all sorts of double-takes from the other campers! Our next day sees us driving into California. 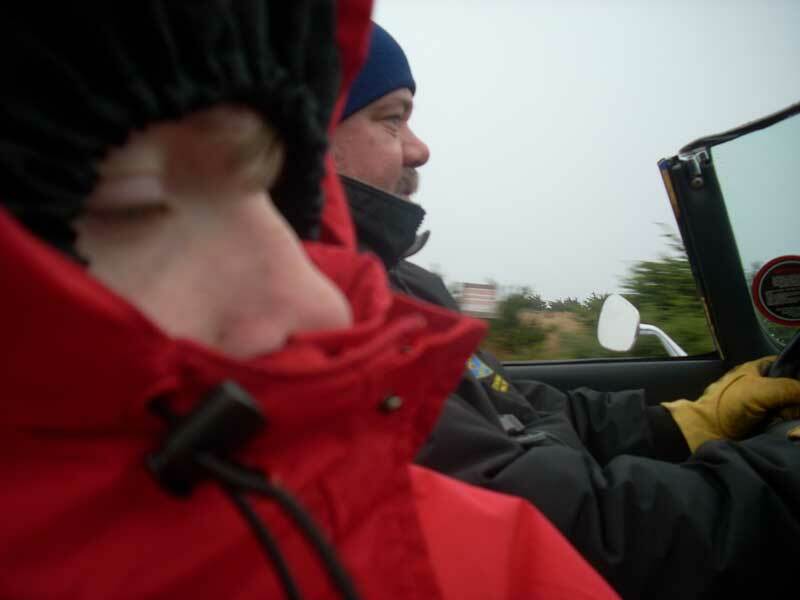 The morning is very cold and foggy, and we are dressed for the arctic as we cruise top-down through the chill. We stop for an early lunch with friends in Eureka, then drive the Avenue of the Giants through the amazing Redwoods. It is blazing hot once away from the coast so Chris and I opt for Highway 1. The coast however, is completely shrouded in fog. Caught between the frying pan and the fog, we head down California Highway 128 towards Booneville in the late afternoon, as it cools off, enjoying dinner in Santa Rosa. We spend the night with a friend in the Bay Area, after a long day on the road. As we ticked off those miles Chris and I spent a lot of time talking, which is always good. 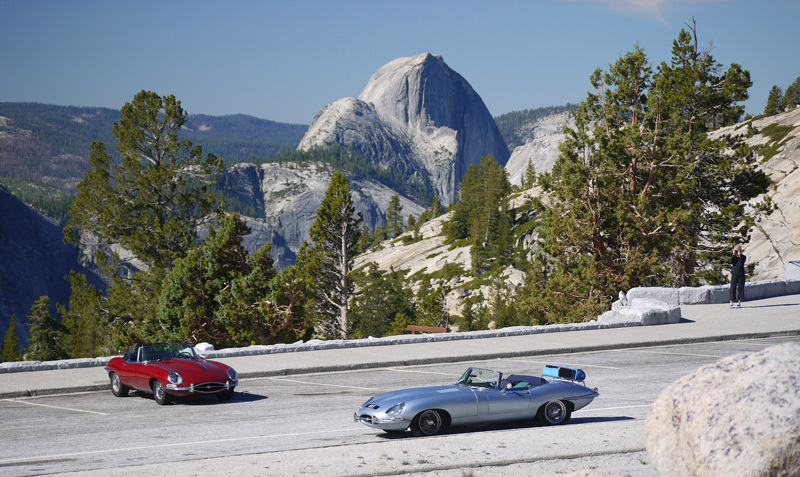 Day four turns out to be action-packed, with visits to three E-type owning friends south of San Francisco, and driving in a pack to a lunch in Carmel. Along the way our caravan of three E-types happened upon another E-type going the opposite direction, not something you expect on a Thursday afternoon! After lunch we part ways with our Jaguar friends and head south along Big Sur with instructions from them about an amazing, little-known road to take halfway down the coast. Along the way we stop for a break and to admire the view when by complete chance we meet another Jaguar friend (though he’s driving a Lotus at that moment) who is driving the other direction. He stops when he sees us and tells us about Elephant Seals hauled up on a beach further south. I let Chris decide which way to go and he picks the seals. It is important to let Chris the pace and course of the trip. I’m happy to drive anywhere, so when he decides to see the seals it is OK with me. Neither of us have ever seen them before, and it is a shock to see how big they are. 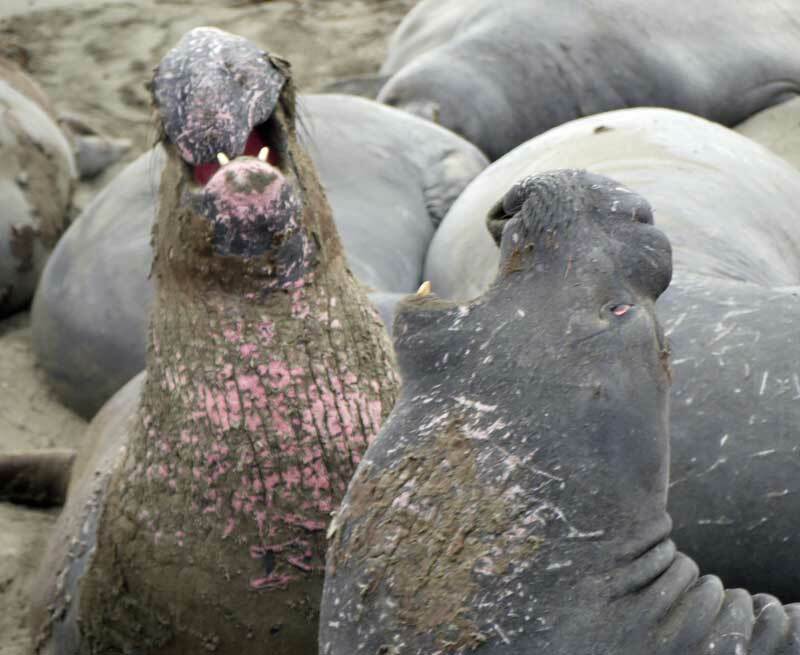 Unlike the Harbor Seals and Sea Lions we’ve seen around Seattle, the Elephant Seals are simply enormous. Though most are just sleeping on the beach, there is always some bellowing and minor confrontations going on. It is fascinating to observe. 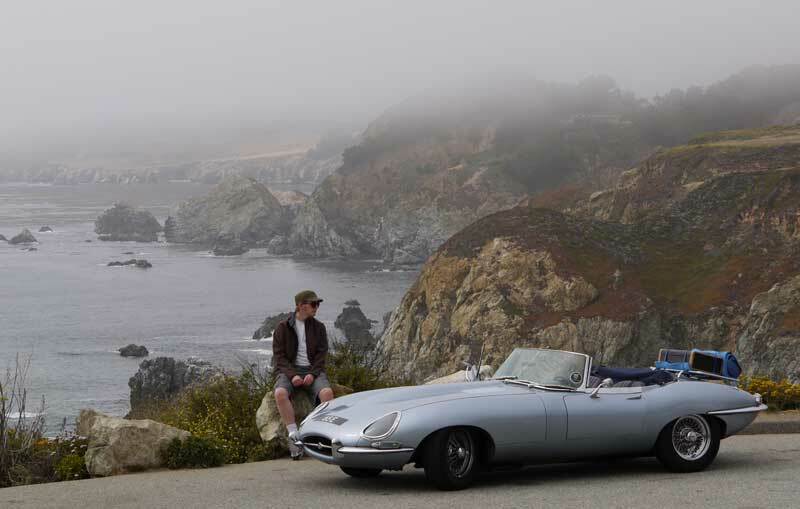 Chris oddly declines a visit to San Simeon, and I pilot the Jaguar inland as more fog rolls into the coast. We climb the coastal hills and are treated to a a spectacular view. We head over to Paso Robles for the night, with a great pizza dinner enjoyed with a fine local Petite Syrah – tomorrow we’ll arrive in LA! I have some parts waiting for me at the will call window at XK’s Unlimited in San Luis Obispo; some clips to secure a loose chrome trim strip on the passenger side door sill. I bet the cashier has no idea that I’ve driven four days to pick this three dollars worth of partsâ€¦ in the very E-type they’ll fix! Parts secured, we venture onwards through Ventura and towards Malibu. A familiar name catches my eye as we’re cruising along the coast highway and I hang a u-turn. 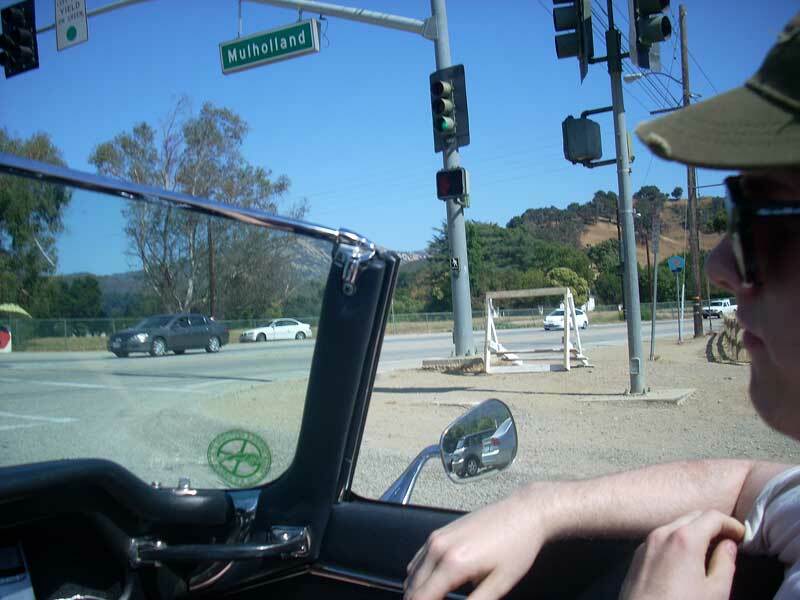 I’ve always wanted to travel the length of Mulholland Drive in a cool car, and here’s my chance! The famed road follows the crest of the Santa Monica mountains and according to my map, will take us all the way through the Hollywood Hills. What a cool way to enter Los Angeles and end our journey! While it is better than following the main highways, it turns out my map is wrong, and Mulholland Drive is broken by an unpaved, closed to motor vehicles section in the middle. Oh well. We meet up with a friend of mine who works for RAND for dinner in Santa Monica, then complete the rest of Mulholland Drive in the Hollywood Hills after dark. 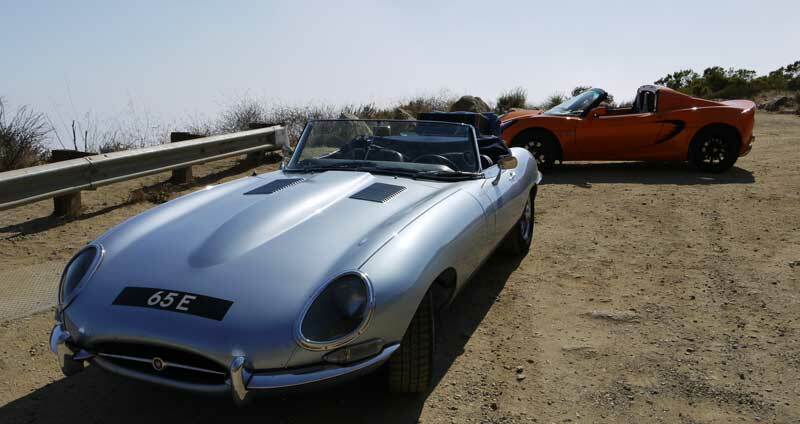 Our final destination is the house of a friend and fellow E-type owner in La Canada, Larry Wade. Larry is the person who originally inspired this trip, taking a similar one in 2006 with his two kids (same ages as mine), using my home as the apogee of his journey. He was now returning the favor, allowing us to use his home as our turn-around spot. 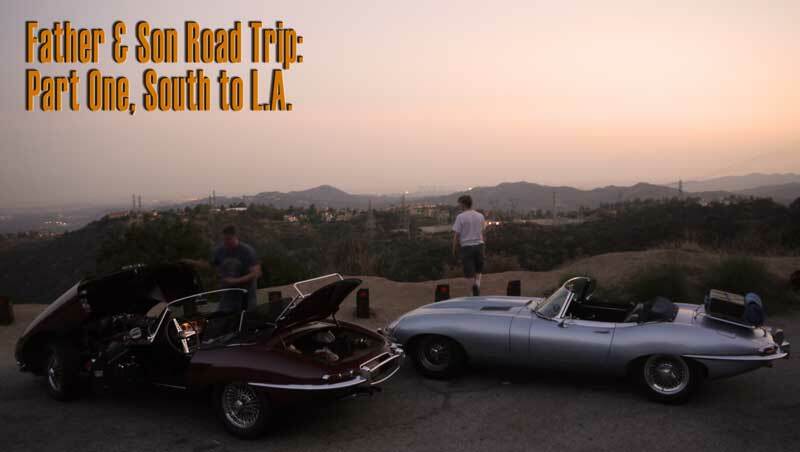 We have a rest day in LA, which involves going to a local car show with Larry, then a spirited drive in our two E-types up the Angeles Crest Highway followed by a night time visit to the Mt. Wilson Observatory with a spectacular view of the entire Los Angeles basin. The next day Christopher flies home to Seattle while his brother wings his way south. I pass the time awaiting my youngest son Nicholas’ arrival attending the Art Center School of Design’s annual car show. Next month I’ll share the return trip with my fifteen year old, through the Sierras, Yosemite, Lake Tahoe, and the northern coast bathed in sunshine. How to carry the ideals and concepts into the future? This is the question heard often within the old car community, frequently in the guise of a pressing problem: declining club membership. 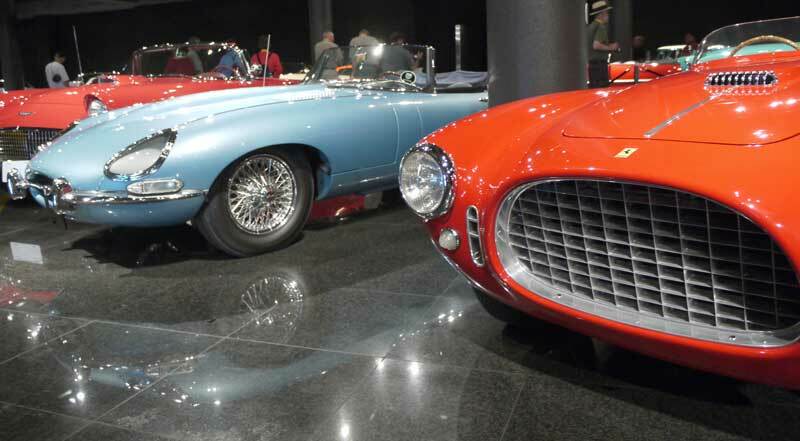 “How do we get young people interested in old cars?” I wish I had a few bucks for every time I heard that question, as I’d be comfortably retired now with the full set of dream cars in my Garage Mahal. The answer is simple: Engage the young directly. Introduce them to cars the same way you were introduced to cars. Have them help you work on your car. Show them how things work. Make them a partner to your passion. Take them for a ride, or better yetâ€¦ Let them drive! Lose the idea that the car is a precious and fragile object, and remember that it is really your passion for cars which is precious and fragile. The passion is what needs preservation and care far more than the car itself. Throw away the “Do not touch this car” sign. A car is a multi-thousand pound industrial object made of steel, glass, and rubber, and it can not be hurt by being lovingly touched, or fervently used as its designers intended. However, without someone to carry on the passion the car (and the club) will inevitably vanish. The car will follow the passion as it is ignited in the next generation(s). So stop treating your old car like it is made of dragonfly wings, and start sharing your passion for cars with somebody young. Like many, I came by my love of all things automotive from my father, a dyed-in-the-wool sports car nut. My childhood was filled with Mustangs, MGs, car shows, and trips to Can-Am races. This didn’t instantly turn me into a car nut, but it planted a seed. Like all seeds the “car guy” bent lies dormant while more pressing items of life are attended to. Cars become a secondary concern in young adulthood as education courtship, family, and career come along. Automotive desires are restrained, but always remain just under the surface. Now in middle age, resources are available to explore this passion personally, and like my father did with me, share it with my two sons. They attend club functions with me, Sunday drives, wrenching in the barn, rallies and road trips. 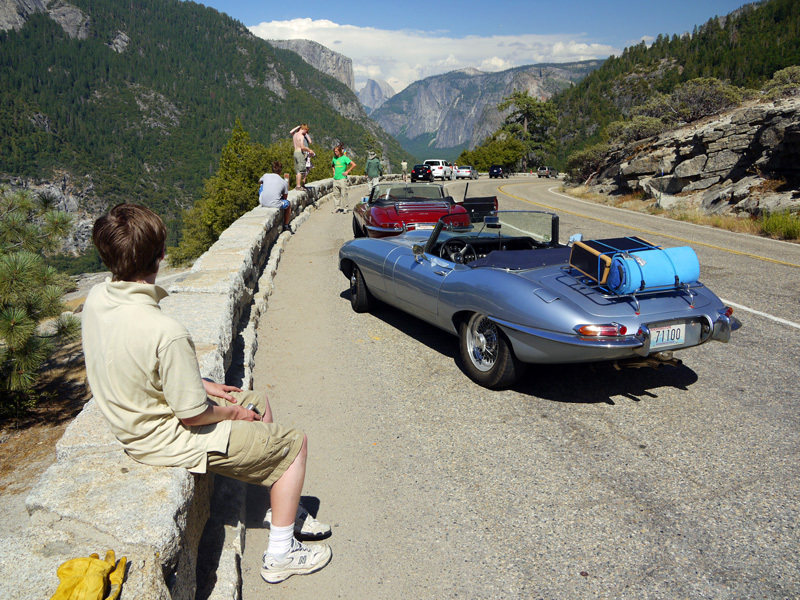 Road trips are quintessential journeys of discovery and there is no better way to take a road trip than in an old car. 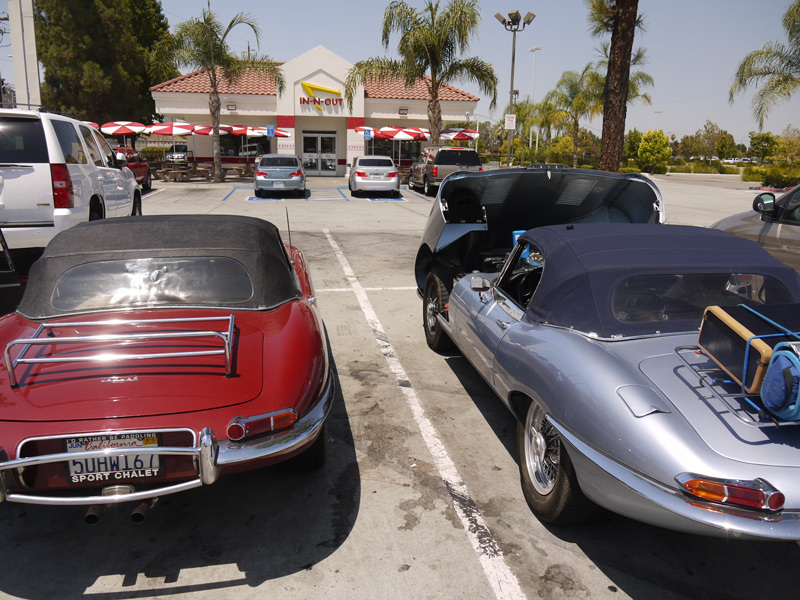 Old cars break down social barriers and invite everyone to be your friend. Stop for gas and people naturally come talk to you. They ask about the car, tell you stories of the one they, or somebody they know owned and wish they’d never sold. Sometimes old cars just break down, but even then I’ve always found that help is closer at hand than you would imagine – other hobbyists will often come to your rescue or assistance. The road is a car’s natural habitat, not the concours field, and seeing an old car traveling the back roads of America is an inspiration to everyone that captures a glimpse of it going by. 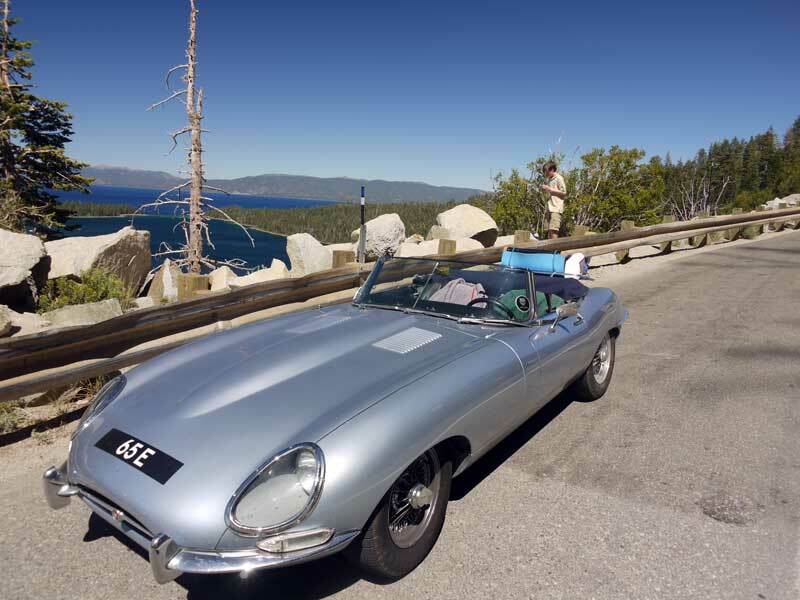 How best to discover and nurture the seed of passion for cars than taking my kids on a road trip in their grandfathers old E-type? Road Trip Rule #1: No Interstates, unless unavoidable. Road Trip Rule #2: No fast food. 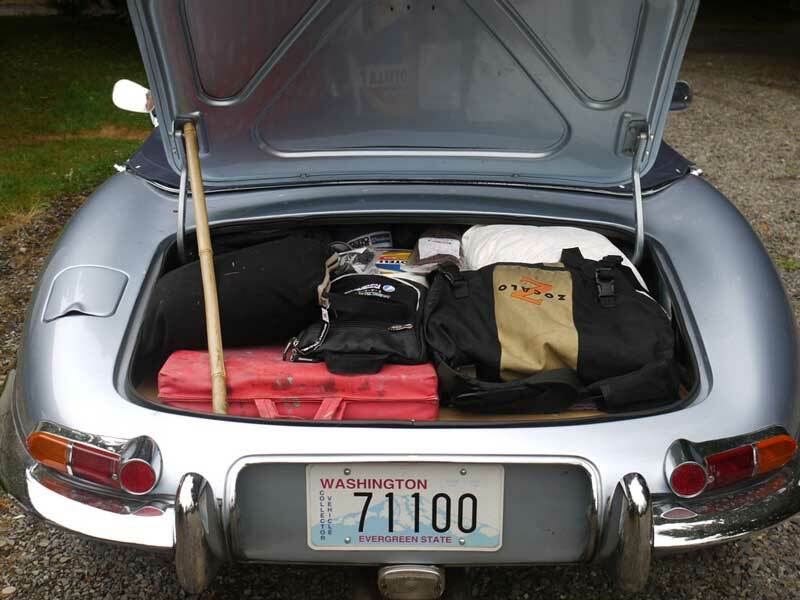 Road Trip Rule #4: Travel light, travel cheap. Interstates are great for getting somewhere in a hurry, but they are dull ways to explore as you are insulated from the environment. While traveling the superslab you are surrounded b noisy trucks, fast food places clustered around every off-ramp, acres of concrete and asphalt. No thanks. We’ll find back roads and twisty highways. We’ll read historical markers and take meals at “mom & pop” places. If the view is nice, we’ll stop and soak it in. If we’re tired, we’ll stop for the night. Our days will not be dictated by a timetable, except for the flights that trade the boys’ places in Los Angeles. We’ll pack a tent and camp out if it suits us. We’ll visit friends along the way. We’ll carry tools and spares and be as self-sufficient and self-determined as possible. All the while we’ll savor the experience of being together, with this amazing machine. Sir William’s Sixth Symphony serenading our ears. The wind in our faces. 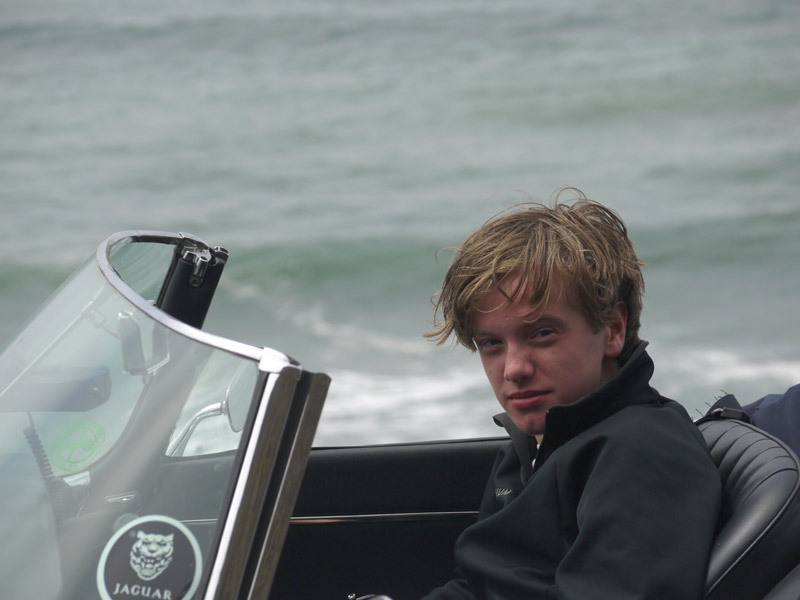 The whole west coast to see in an old Jaguar! Stay tuned for next month where you’ll read about the southbound journey in Part Two. 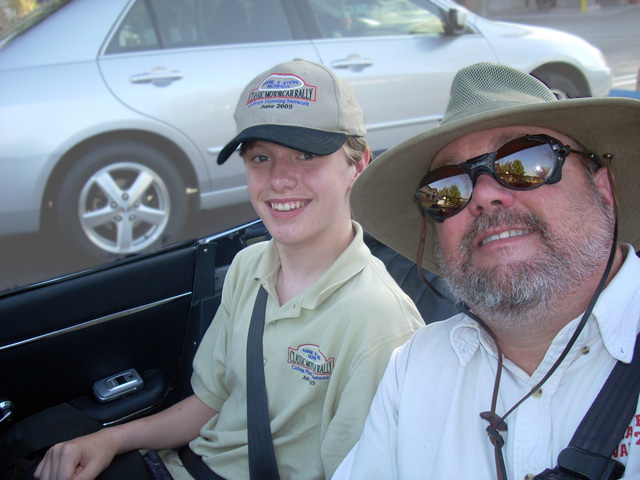 2009 Father-Son Road Trip: Last day. Nick & I started the day unsure if we would drive all the way home. There is plenty to explore in western Washington, and we still had the rest of the Oregon Coast to drive. In the end, like horses who can “smell the barn” home called us and we answered. After yesterday’s long slog into the night we were pretty slow to get moving in the morning. I was actually up pretty early but just didn’t have the heart to wake Nick, who was sleeping like the proverbial log. Instead I went outside in the fog, packed more ice around the starter of the 65E and cared for its other needs such as checking and filling oil, looking for loose bolts (don’t want to have a brake caliper come loose like last summer in Idaho!) Meanwhile Nick slept. Breaking News: The New Starter WORKS! Now that this major milestone has been passed, this hurdle has been cleared, I promise I’ll wrap up the story of our road trip as soon as possible. Happy Dance! Happy Dance! Happy Happy Happy Dance! Author chuck goolsbeePosted on August 2, 2009 August 2, 2009 Categories father-son roadtrip5 Comments on Breaking News: The New Starter WORKS! 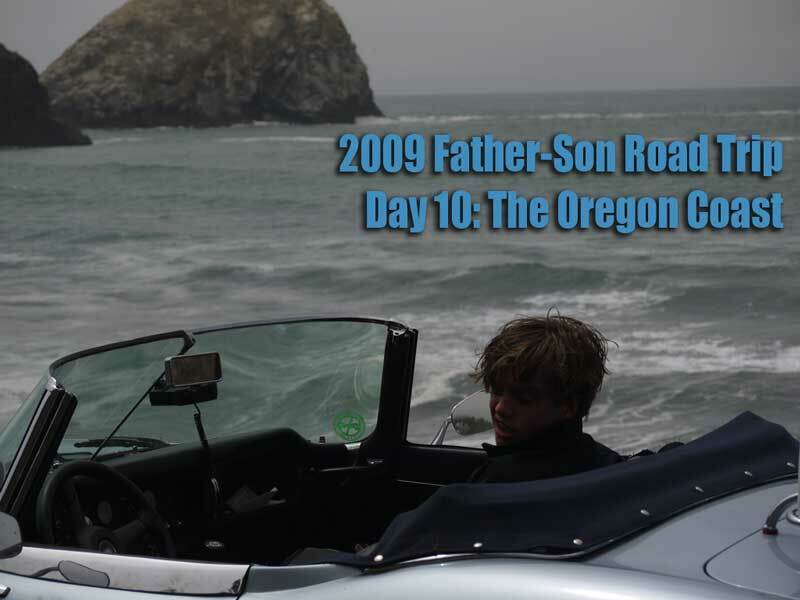 2009 Father-Son Road Trip Day 9, Part 2: The Northern California Coast. Nick & I wander out of the Blackhawk collection a couple of hours later than we expected. We had hoped to make it almost to Oregon, but given that it was already afternoon this was unlikely to happen. I’d been offered a place to sleep by a friend in far northern California, but unless we took to the Interstates, there was just no way we could make it that far before very late tonight. Given the geography and scenic potential of the coast roads, we just cant fathom going inland. We decide to just drive, and see where we end up. Lunch is on our minds. We hop in the car and I lay out the route possibilities to Nick on the map… he wants to see San Francisco and drive across the Golden Gate Bridge, so that’s where we go. 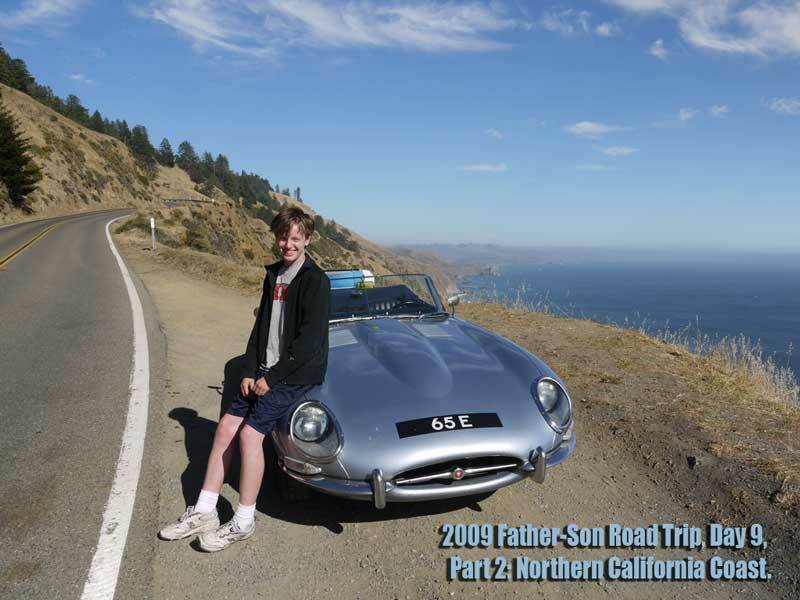 Author chuck goolsbeePosted on August 1, 2009 March 30, 2018 Categories father-son roadtrip1 Comment on 2009 Father-Son Road Trip Day 9, Part 2: The Northern California Coast.